London based Aussie songwriter FETHERSTONE joins forces with producer BREW to release an 80's synth remix - which is then interpreted by Sydney's DESIGN BY STUDIO B into an emblematic, avant-garde music video. 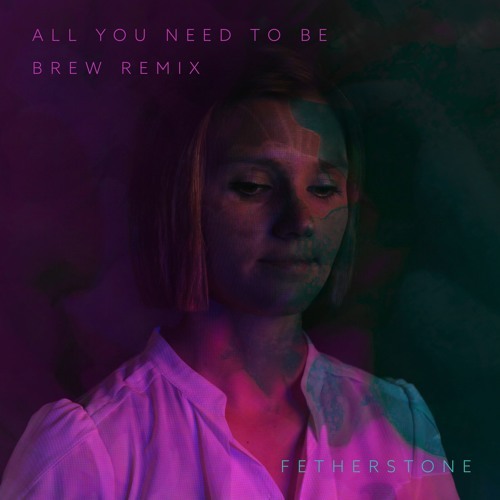 Since Fetherstone hit the London scene in 2016, she's been working closely with London producer Brew on a number of new projects, the first of which comes a remix of "All You Need To Be" from the electro-pop debut EP, released over 4 months April through July 2017. Brew's creative twisting and turning of the lyrics and form have transformed what was originally a ballad into a relaxed dancy track beautifully layered with vocals and synths. This new remix sees the beginning of another artistic collaboration with Sydney based graphic designer/videographer Design By Studio B, who has interpreted the new remix into an imagery filled, avant-garde music video. The track will be released on 31st August 2018 through AWAL and available on Spotify, Apple Music, Itunes and all other online platforms. The video will be out 7th September. Read the full press release here - https://www.dropbox.com/sh/kniorv5ddj6pjcl/AAD_5ctodSQr9ioUuNd1bz1ka?dl=0 BUY ON BANDCAMP - https://fetherstone.bandcamp.com/track/all-you-need-to-be-brew-remix STREAM ON SPOTIFY - https://open.spotify.com/album/6rhQ5YAq4XJFczlJm0j0pp LISTEN ON YOUTUBE - https://youtu.be/xujZe6iTo8U ----- Track: All You Need To Be - Brew Remix Artists: Fetherstone , Brew Catalogue No: FS006 ISRC: GBKPL1817924 Track Artwork: Design By Studio B Video production and effects: Design By Studio B Single Release date: 31 August 2018 Video Release Date: 7th September 2018 CONTACT : Briana Cowlishaw, fetherstonemusic@gmail.com, +44 7765 715 032 ONLINE LINKS: www.fetherstone.com www.instagram.com/fetherstonemusic www.facebook.com/fetherstonemusic www.twitter.com/fetherstonemu www.youtube.com/channel/UCifg0ZOZ4ulCKxNe1YhQ_Vw open.spotify.com/artist/3ezaJbd6mYk5zZAfW81Ore LYRICS What's the point of breathing, If you can't feel your lungs moving in and out? What's the point of loving, If you can't love yourself? (don't see what others see). CHORUS What's the point of, Loving, seeing, living, loving, Breathing, breathing, loving, seeing, Living, living, loving, loving, Breathing, breathing what's the point of breathing, If you can't love yourself? What's the point in sharing If you don't stop to take in there blessing What's the point of living if you live to put yourself down? (down) CHORUS You, are beautiful and, You, are wonderful and, You, don't see what others see, You are all you need to be.